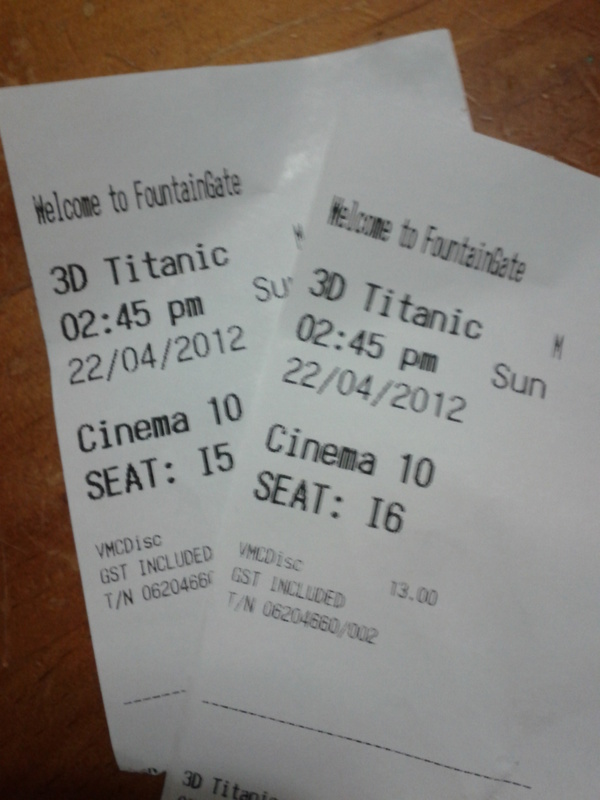 Today I took my big girl to see Titanic in 3D. I loved this movie so much when it came out and I wanted to share the experience with my daughter. I first watched Titanic as a newly wed, along with my sister and brother-in-law. I remember being so caught up in the love story and enjoying every minute until it hit me — this really happened (not the love story part – the Titanic part). Fifteen hundred people died in a senseless tragedy that really could have been avoided. That realisation in the midst of the screening hit me so hard, I began to cry. And not the usual silent-tear-trickling-down-the-cheek kind either. I was actually sobbing. My hubby, hero that he is, offered me his shirt sleeve to wipe my eyes. Of course, we have just commemorated the 100 year anniversary of this tragedy, so everybody is talking and thinking about the Titanic event once again. But, it was a catastrophe of such magnitude, how can we not let it touch us or move us? So many souls were lost, many probably to a godless eternity. It moves me again, to spread the message of Jesus’ salvation wrought by the cross, because you never know when such a tragedy might strike again. Even in recent years, we have seen natural disasters aplenty, with thousands of lives lost. It is an easy thing to become numb to all the suffering, but I don’t think we can afford to. If we don’t care, how will we ever step out and try to make a difference. As Jack says in the movie, “I figure life’s a gift and I don’t intend on wasting it. You don’t know what hand you’re gonna get dealt next. You learn to take life as it comes at you… to make each day count.” Here’s to making it count.